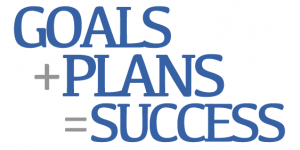 Home / Sale Tips / Goals + Plans = Success! Goals + Plans = Success! We are halfway through February already, so how is your “2015 Plan” going? Did you make a plan and set goals for this new year? Did you write them down? Did you share them with anyone? When creating a plan, you will put steps into place with the purpose of assisting you to reach your goals. Goals without a plan are worthless. Goal setting is often difficult, but it is necessary for success. Goals need to be specific, ‘I want to grow my business in 2015’ and ‘I want to make more money in 2015 than I did in 2014’ are too general of goals. Try setting a more specific goal such as, ‘We want to grow our business by 20% in 2015’. While planning to reach your goal, you realized that you had a 20% increase in leads by spending $50.00/month on Facebook marketing in 2014. For your 2015 plan, you might plan to increase your spending to $100.00/month on Facebook marketing. Be sure to track and analyze all the results of your efforts. Another great example with a goal I have set in the past with my carpet cleaning company was to establish a proactive referral program for all of my customers. I gave a 10% referral back to the referring party for every successful new job they referred to me. Print referral cards, hand them out on carpet cleaning jobs, and watch your sales rise. These examples are just a couple of simple ways to talk about goals and devise a plan to reach them. It’s not too late to do this for 2015!